Multi-material 3D printing is an innovative additive manufacturing technique that enables the creation of objects with different materials and properties. By adding more complexity to a part, multi-material 3D printing can greatly enhance part performance and functionality. The technology, therefore, opens up a whole new range of possibilities of design and production – and enables the creation of objects that would otherwise be impossible. Currently, multi-material 3D printing is possible with a range of plastics, polymers and even silicones, making it an ideal solution for producing realistic, full-colour prototypes and concept models. In this tutorial, we’ll delve into the benefits of multi-material 3D printing, the current processes that are available as well as the most common use cases and applications. What are the advantages of multi-material 3D printing? One of the key benefits of multi-material 3D printing is that complex parts with different material properties can be created in a single printing process. This differs from single-material parts, which require assembling to create a part with different material properties. Multi-material 3D printing can therefore reduce the number of steps necessary to produce an object, resulting in a faster product development cycle. Designers and manufacturers can also greatly benefit from multi-material 3D printing, as combining different material properties (such as translucency and rigidity) within one part can take design validation and functional testing to the next level. Another advantage of using various materials in 3D printing is the ability to create colour gradation. By mixing materials in various ratios, different colour combinations and tones can be achieved without the need for subsequent painting – saving time during the post-processing stage. How does multi-material 3D printing work? With multi-material 3D printing, different materials can be used within a single 3D printed object. However, while multi-material 3D printing is currently capable of processing materials like thermoplastics and polymers, combining different metals or ceramics is not yet possible at this point in time. Mixed tray: This option allows you to simultaneously produce several parts made up of different materials – and therefore different properties – within a single build. The mixed tray option is potentially an ideal option for companies that require high volume prototyping. Mixed part: Multi-material 3D printers can also print parts with varying properties in specific areas. Additionally, combining materials within a part eliminates the need to subsequently assemble separate parts. 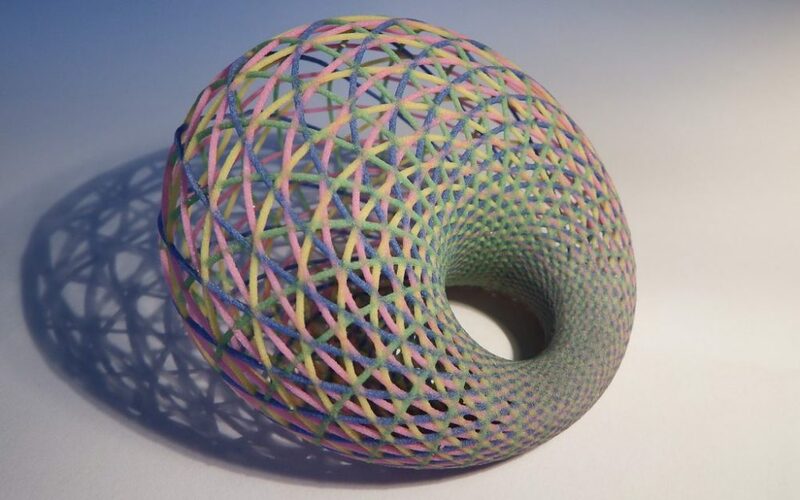 Digital materials: Created by mixing two or more materials, digital materials are used to create an object with improved properties and appearance that cannot be achieved if a part is 3D printed in a single material. Which technologies are used for multi-material 3D printing? Currently, material jetting is the most commonly used technology for multi-material 3D printing. With material jetting, printheads deposit droplets of a photosensitive material (or a mix of materials or different materials through different printheads) that cures under ultraviolet (UV) light. The part is then created layer by layer using this process. Stratasys and 3D Systems are the leading manufacturers of multi-material 3D printers based on material jetting technology. 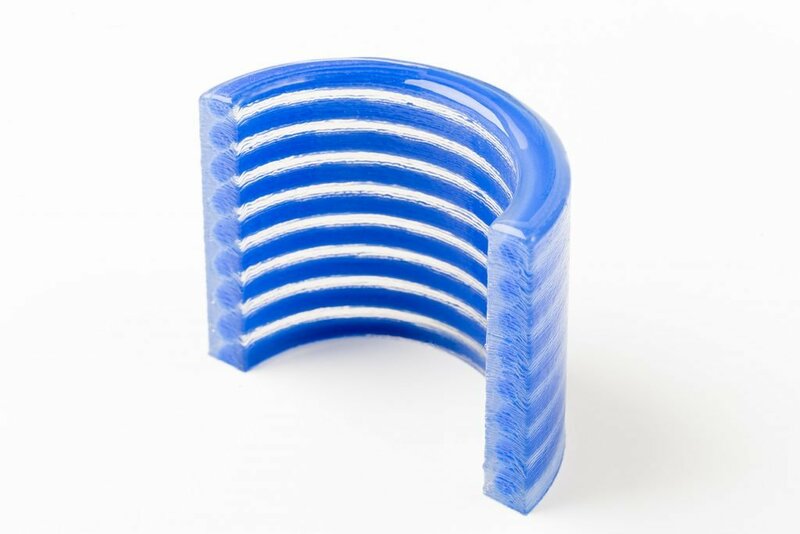 For example, the Stratasys’ Connex™ 3D Printing System works by jetting two or three different plastic materials during the 3D printing process. This results in the completed part possessing different properties (such as rigidity and flexibility) simultaneously. Which materials can be used for multi-material 3D printing? Currently, the most widely available material options for multi-material 3D printing are acrylic-based photopolymer resins and composites of rigid plastics and elastomers. 3D Systems, for example, unveiled a new large-format multi-material ProJet MJP 5600 3D printer last year, which works with a range of plastic resins and their combinations to create fully assembled prototypes and complex geometries with multiple material properties. Although the materials can vary in mechanical properties, advances in 3D printing materials mean that engineering-grade composites are also available. One of the latest innovations in multi-material 3D printing is silicone 3D printing, a technology developed by ACEO®, a subsidiary of Wacker Chemie AG and long-time user of RP Platform. ACEO®’s innovative silicone technology enables the production of silicone parts with different colours, hardness and properties. A useful application of this is the creation of silicones that have insulating and conductive properties, as these can be used to create an assembled part with integrated electrical conductivity. ACEO®’s silicone technology can create silicone parts with different material properties. The possibilities of multi-material 3D printing are truly endless, with a wide range of use cases across consumer, medical and other industries. Currently multi-material 3D printing is primarily used during product development. For example, the swimming gear company, Speedo, has used the technology create items such a goggles and other swim gear as part of the product design cycle. Creating other products, like functional prototypes of seals, gaskets, tires and footwear soles are also possible with multi-material 3D printing, with the technology being used to test and verify the design and function of the product before going to production. As multi-material 3D printing can combine translucent and opaque materials, the medical industry has embraced the technology to create realistic anatomical models for educational purposes, as well as patient-specific models for pre-surgical planning and training. The technology also allows creating translucent parts with internal coloured structures, which can be used to visualise fluid flows or to test medical devices. 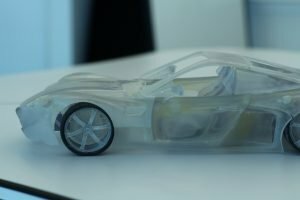 Mechanical engineers within automotive, aerospace and other industries can use multi-material 3D printing to create functional prototypes with final-product look (colours, labels etc.). In addition to this, multi-material 3D printing allows manufacturing moulds for short series of injection moulding and tools without the need for assembly. One interesting element of advanced multi-material 3D printing is the ability to create parts with integrated functions, which is particularly useful for electronic devices. Nano Dimension Ltd. has recently made a breakthrough in the development of multi-material 3D printing inks. Conductive and dielectric inks now can be used simultaneously to manufacture electrically functional parts, circuits and antennas. While multi-material 3D printing is currently primarily used for prototyping, it nevertheless has huge potential for the production of parts composed of different materials and possessing a combination of mechanical properties. Ongoing research is therefore underway into how the existing challenges for multi-material 3D printing of functional parts can be overcome. The difficulty lies in developing a scalable and repeatable production process that can deliver high-quality multi-material end parts. This is particularly challenging for metals and ceramics, as there are clear physical limitations in co-melting two materials that have, for example, different melting temperatures and other material properties. However, Belgium-based company, Aerosint, claims to have developed a unique multi-material powder-bed process to produce end parts, with metals in its sight. The technology, which works with polymers, controls the distribution of two different kinds of powders on the voxel level which are then sintered together. Another fascinating area of research is multi-material bioprinting, which could have a revolutionising impact on areas like tissue engineering, regenerative medicine and biosensing. However, today, multi-material 3D printing offers huge opportunities for product development and validation testing, as the technology enables the creation of realistic 3D-printed models and prototypes with varying properties. Ultimately, the next step for multi-material 3D printing will be how to successfully make the shift to the production of end parts with integrated functions and enhanced mechanical properties. This area of development, which is already seeing much activity in terms of research, will expand the potential of additive manufacturing to new horizons.